Kosovo just appointed the new governor of its central bank. Until a few weeks ago this person, Bedri Hamza, was finance minister. He is a member of (or very close to) the PDK party, which rules Kosovo since 2007 and is led by the prime minister, Hashim Thaçi. I saw a picture of the new governor at PDK’s congress sitting in the front row between the prime minister and the head of PDK’s illegal secret service, named SHIK, which was formally dissolved in 2008 but is still believed to be engaged in organized crime, political crime and corruption, in the broadest sense. 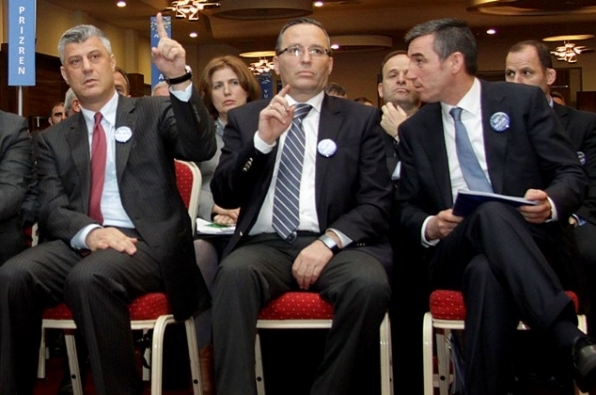 This is a scandalous choice, for both general reasons and reasons that concern Kosovo’s defective governance system. To ensure that a central bank be effectively, and not only formally, independent, all members of its decision-making bodies should be independent themselves, and clearly perceived as such. This is an important principle in the EU. Persons who played an active political role prior to their appointment in the central bank, or have a clear political affiliation, can be used by other institutions or political parties as a channel to exercise pressure on the central bank: their mere presence creates an opening, and incentive, to exercise such pressure. Moreover, a central bank should be able and willing to speak to criticise the economic and budgetary policies of the government, if necessary: its ability to do so is greatly reduced if the governor has a clear political affiliation, and the credibility of its public statements disappears entirely if the governor was the finance minister of the ruling government. In short, appointing persons with a political affiliation is a heavy, if indirect, form of political interference on the central bank, it opens the door to direct interference, and is therefore diametrically contrary to the spirit of the statute of the ECB. Hungary recently appointed a former minister as governor of its central bank, and was widely criticised. The EU did not formally stigmatize that appointment, however, because its rules do not explicitly ban such appointments, and because persons with a political background have been appointed also in the central banks of other member states. Yet, the broader governance context matters: in a well-governed state, where the independence of the central bank is a widely shared and scrupulously respected value, such appointments are far less problematic, for the broader governance system and the prevailing informal norms can deter and sanction any attempt to improperly influence the central bank. This is the case, for instance, of Germany and the USA: their current governors were both advisors of political leaders (but were not ministers, or recognisably political figures, like the new governor of Kosovo’s central bank). But where governance is bad, and central bank independence at risk, such appointments are extremely dangerous. This is the case in Kosovo, as some recent episodes will demonstrate. The press reported that in early 2010 a former KLA commander used explicit threats to press the then central bank governor, Hashim Rexhepi, to issue an insurance license to a dodgy company that did not meet the conditions: the then finance minister, Ahmet Shala, was at the meeting when the threats were made, and stood on the side of that KLA commander. Despite this, former governor Rexhepi refused to issue the insurance license. A few weeks later a person credibly speaking on behalf of prime minister Thaçi asked former governor Rexhepi to invest all the public money deposited in the central bank (tax revenues, a large privatization fund, and part of the pension fund) in three banks of a non-European state. Again, Rexhepi said no. Then a media campaign against him begun. Then he was arrested, for the same accusations used during that campaign. It later emerged that they did not stand on their feet, and were largely based on anonymous letters. I am convinced that these charges were based on dossiers prepared by SHIK, PDK’s illegal secret service. Former governor Rexhepi was cleared of all charges, but while he still was in jail he was dismissed by an illegal decision of parliament. In 2011 the government tried to appoint a more pliable person as governor, but this man was ineligible and the Kosovo’s international supervisor, the ICO, stopped his appointment (disclosure: I was involved). As a result, parliament elected as governor a competent and independent person. The interpretation is simple. The central bank controls markets where a lot of money can be made, and lost by citizens. The prime minister’s circle tried to influence its governor, but failed. So they engineered his downfall and tried to appoint one of their men in his place. In 2011 they failed. Now they succeeded. In 2010 the newly appointed governor, Hamza, was the deputy of former finance minister Shala, who supported the KLA commander when he threatened former governor Rexhepi to persuade him to break the law. This person wanted to acquire an instrument (an insurance license) through which one can do money laundering, if the central bank doesn’t pay attention, or part Kosovars with some of their money. What will happen if this person asks governor Hamza to issue him an insurance or banking license without asking too many questions? And if he gets one, why shouldn’t other former guerrilla leaders get one too? How will governor Hamza supervise the banks and insurers where Kosovars deposit their money: will he intervene if they start lending money to friends who could run away with it, or if they risk going bankrupt? And how will he behave with the banks that do not belong to the friends of his PDK party: will he be fair, or will he try to weaken them or push them out of business? Banking systems are delicate things: if one big bank goes bust, other ones will. If his friends push him too much and the new governor makes a mistake, therefore, the consequences could be catastrophic. This appointment endangers the money of Kosovars and the economy of Kosovo. It is a risk to the safety of bank deposits, of insurance policies, of Kosovo’s privatisation fund and of its pension fund. This appointment was possible only because the central bank law (art. 40.3) only says that one cannot at the same time be governor and minister: a ridiculous rule, like saying that the prosecutor cannot also be judge; in 2010 I lost a battle on this rule against Shala, Hamza and others. It presumably is for this reason that the international community has not criticised this appointment; it certainly is for this reason that Kosovo’s government fought tooth and nail to have that rule.